Millimetric facial imperfections in the face are equal to one mile in the soul, and small changes can provide a tremendous improvement to the facial form of the patients.Rhinoplasty without Surgery is an application that helps to regulate the contours by applying fillings to our patients who do not want radical changes in their nose. What is Rhinoplasty without surgery? Filler application, which is a highly reliable injection used in many fields of health and especially in medical aesthetic applications for almost half a century, is a complementary application in which many useful contents, especially hyaluronic acid, can be injected into the subcutaneous tissue. Filling applications can provide solutions to skin problems with wrinkles and loss of volume, as well as a practical application to those suffering from contusion problems and nose tip ptosis. Fillings are under the title of facial aesthetics and they are included in the application of facial filling, providing a practical solution in Rhinoplasty. Anyone who complains of nose ptosis but do not want radical changes and to take the risks of surgical interventions can have this procedure applied. It is an extremely comfortable process, especially for the generation of a new profile and for the nose ptosis. How is Rhinoplasty without Surgery made? In Rhinoplasty without Surgery where outpatient protocols are applied, the aim is to reshape the nose with a filling application without any radical change. You do not even need anesthesia during the procedure. It is a painless process with no laceration. By implementing applications to the problematic areas of nose, and existing skewness, collapses or irregular profiles are filled and the nose profile is lifted in a suitable way. The muscles pulling the tip of the nose down are injected and the erection is achieved. In addition, contour corrections are made with the application of fillings on the same region. With small touches, a result with aesthetic profile appears. You can immediately integrate into your social life after the process. No bruises or eudema is experienced. There is no need for any recovery process and period. Is Rhinoplasty without surgery permanent? The permanence of the filling application varies depending on the individual, that is, depending on the biological process. You can observe the continuation of the application for an average of 6 months to 2 years. With a 10-minute operation, you will have a comfortable contouring experience for 2 years. By having this temporary application, you can decide whether you want a permanent operation or not, you might have a more positive attitude towards Simple Rhinoplasty and operations and have a clear decision. Who can have Rhinoplasty without Surgery? • As there is no laceration, it is painless and does not have any possible surgical complications. • It helps you to have a new profile with little touches. • It is a practical application that lasts 10 minutes on an average. Why Did I Have Surgery? Because it’s a treatment without using any chemical, which take the same body fat then extract The Stem Cells to inject it to the hair scalp to Give Stronger, Healthier, Shinier Hair, and Reduce the Hair Falling. 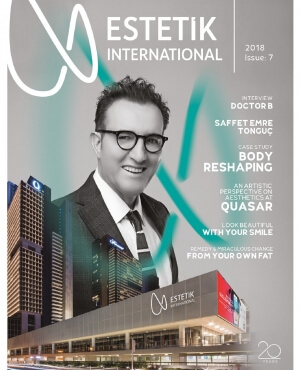 This Technique had been developed in Estetik International Laboratories by Dr. Bulent Cihantimur. How the "Organic Hair Transplantation” is performed? If you have a troubled nose bridge and want to change it, and if there is any ptosis at your nose tip there are 2 main options for treatment.The first is surgical treatment, the second is injecting a subcutaneous gel-like filling application with a less invasive option.The basis of Rhinoplasty without Surgery is filling. How is nasal filling made? First, the patient is assessed and his/her photographs are taken.Information about pros and cons of this aesthetic procedure is given.Then, the skin is cleaned.A cannula needle is used to place the dermal filler material.As we inject, the patient will see the results instantly. What are the risks of Rhinoplasty without surgery? Risks, such as bruising or a small swelling, are not very common and are temporary. Is Rhinoplasty without Surgery painful? It is actually a painless procedure, but still topical anesthetic creams can be used 45 minutes before the operation. What is the satisfaction rate for Rhinoplasty without Surgery? Satisfaction rate is high because it is practically applied and social life is not affected. How long does Rhinoplasty without surgery last? It is not a permanent procedure, but it is possible to last between 6 months to 2 years if the time is planned well and the surgeon makes the plan to fully meet the expectation of the patient. What is the cost of filling application on nose? The cost of the treatment will vary depending on the product used and the rate of filling.For this reason, we recommend you to have an examination first or to consult with our health consultants about the price. Is Rhinoplasty without Surgery only for patients with ptosis? It is often used for patients who feel their nose bridge is too low, and can also be used to hide the appearance of the bump below the bridge, the arch, the cavity or the collapse.